OTT media services are providing a convenient experience to their customers, they have great original content, and their costs are competitive (or even lower) to Cable TV. Because of all these reasons, the inevitable result start occurring - Cable TV is on a decline, where OTT services are showing great growth. According to the data from comScore in April 2017, 53% of Wi-Fi connected households in the U.S. are using at least one over-the-top streaming service, with Netflix being the primary choice. According to that research, Netflix is the primary choice across these households with 75%; but there is a significant competition knocking Netflix’s door. 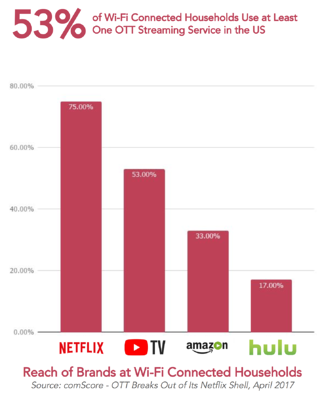 YouTube has 53% of range, followed by Amazon with 33% and by Hulu with 17%. Knowing that Netflix is the digital television brand with the highest penetration in the US, comparing its number of subscribers with cable TV subscribers will be a good indicator. According to Netflix’s public announcement in June 2017, Netflix has 50.85 million subscribers in the US. According to the report published by Leichtman Research Group in May 2017, the total number of subscribers of top cable TV providers in the US is 48.61 million; which shows the penetration of Netflix in the US. 1. How is the customer experience of digital television companies? Which company is the Apple of this industry? 2. What are the primary channels for watching TV shows and movies? 3. What are the exclusive percentage of customers of digital television services? To find answers to these questions, we have researched 497 consumers on our Bounty platform, where more than 420,000 real consumers are answering questions every minute. On this research, consumers are asked about their previously used services, currently subscribed services, the primary channel for their TV show/movie consumption, and their satisfaction with subscribed platforms. We have generated insights and suggestions for you according to the state of the market, for you to execute consumer-oriented tactics. To access the report, use the form at the right and share your contact information with us. 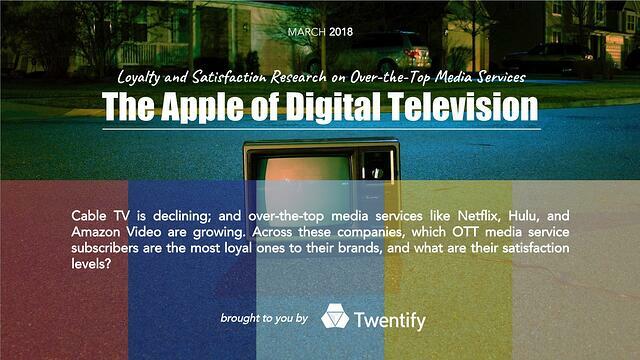 You can download this 22-pages long report that includes results of the loyalty and satisfaction research on OTT media services and market insights for free by clicking on the button below.